Stumbling my way through this massive blogosphere, I chanced upon the cries from a fellow mommy blogger publicizing her idea to help boost the blogonomy. Motherhood Uncensored has devised a simple scheme that will help us recover our unfortunate blogging recession. 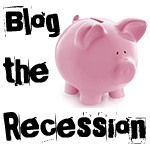 For the month of August, join her Blog the Recession campaign and show the love to feel the love. Click through my links and leave a comment on one my pages or another blogger’s page, and hopefully, a fellow blogger will do the same for you. It’s blogger karma at its finest! Time to pay it forward, my friends! Lord knows, I could use some more traffic love! 😉 Feel like joining the campaign? Simply, visit her site, grab the code for her piggy bank widget and add it to your collection site. Now who doesn’t love widgets, especially cute little piggy widgies? This entry was posted in Uncategorized and tagged blog, bloggers, blogonomy, blogosphere, comments, friends, karma, Mommy Bloggers, Motherhood Uncensored, piggy bank, random, recession, widgets by Run DMT. Bookmark the permalink. I am a glamorous Domestic Diva raising three beautiful and brilliant children (ages 10, 7, 2). I have been married to my DH for 11 years. Before my blissful life as a SAHM, I taught elementary school for 7 years. I also organize a mommy group on Meetup.com, where I have met the most outstanding women and some of my best friends. Four years ago, I discovered a passion for running. I am currently training for my third marathon as well as a variety of other races and triathlons. I aspire to become a published children's author someday. I don’t have ads on my blog so it doesn’t really matter..You do though, how do you have ads and you are using wordpress? I got ya in my reader and that is precisely how I clicked through, sharing the traffic, er love is what it’s all about! You were my very first comment and I am so happy to be “official”. I am not sure how this whole thing works, but I would like to list you in my blogroll since you, too, are a runner. BTW, I grabbed my piggy and am in the process of trying to end the blog recession. Share the traffic — bloggers helping bloggers. I like the philosophy, and I’m enjoying exploring new blogs.